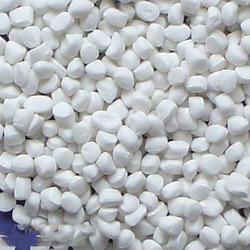 Prominent & Leading Exporter from Ahmedabad, we offer filler masterbatch. Our filler consists of fine Calcium Carbonate Blended with Specialty Polymer and additives, allowing much higher loading compared to conventional Filler Masterbatch. Product Suitability: Calcium Carbonate Filler Masterbatch for PP/HD RAFFIA plant, HDPE Lamination Plant, PE Blown Films, PP Blown Films, Woven Sacks, Raffia, Injection Molding, Blow Molding, Roto Molding and other Purposes. Advantages: Advantages of using our filler. Cost Benefits: High loading for HDPE /PP gives Considerable Cost reduction. Production Increase Increases production more than 10% compared to any other filler in the market. Quality Benefits: Produced on advanced manufacturing equipment under stringent quality control ensuring consistency in every lot. Powder formation is much lower compared to conventional filler Masterbatch.